When the members of the Ruan Hurling Club held their A.G.M. in January 1948 little could anyone present, in their wildest dreams, have imagined what an exciting, controversial yet ultimately unforgettable year was ahead of them. Chairman Art Mc Gann, Vice Chair Paddy Meaney, Secretary Miko Lyons, and Treasurer Mick O Shea. The County Board of 1948 was under the stewardship of Chairman Fr. Corry and Secretary Mick Hennessey. In his address to the delegates present at the January meeting, the Rev. Chairman urged that clubs would strive for clean play. He also informed those present that gambling and interference by spectators would be dealt with promptly as a matter of fixed policy. Registration for the various competitions also took place and Ruan entered teams as follows. At the County Board Meeting March the draws were made for the various competitions. • Intermediate Championship; Ruan v Newmarket. • Minor Championship. Ruan v Clare Castle. In the opening rounds of the Clare Cup - Newmarket beat Ruan 2-9 to 2-6 in Round one - while in Round Two Clarecastle were victors on the score of 7-4 to 3-3. In the preview to this particular game the Clare Champion reported that “Ruan never seem to be at their best until they are playing the Magpies and Sunday should be no exception.” Two pitch encroachments - one in each half - delayed the ending of the match. A sign of things to come perhaps! Ruan and Ennis met in the First Round of the Senior Championship in Cusack Park on July 25th. A smaller than expected crowd attended this game, while the strong cross field wind on the day made play difficult. Players from both sides also complained that the grass was too long. Ruan led from start to finish and availed to the full of the scoring chances that came their way. Ennis had good individuals but lacked the combination of their opponents. A goal from Joe Mc Donnell set the tone for the game while the speedy play from McNamara and Smyth at midfield brought good results time and time again from the Ruan forwards. Leading by 2-4 to no score at half-time the game was becoming too one–sided to maintain the interest of the crowd. In the second half Ruan kept adding score after score but Ennis were unlucky with wides and unfinished attacks. While Ennis kept their positions better and the play was faster and closer Ruan were able to counter almost all their efforts. The game ended on a score of Ruan 6-7 Ennis 1-1 confirming that on the day Ruan were a far superior team. Willie O Halloran of Crusheen had the onerous duty of referee! 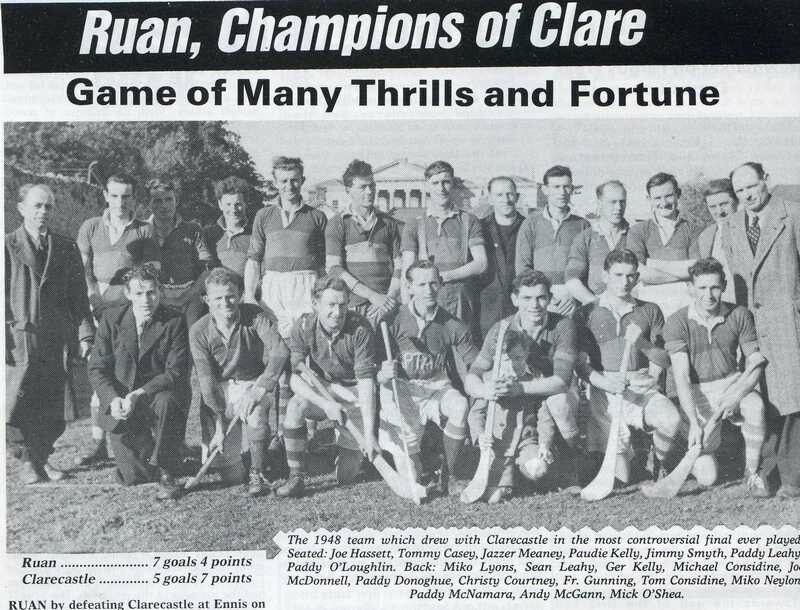 Ruan were now through to the semi-final of the competition where their opponents were Scariff who entered the game as warm favourites - being finalists in ’41 and 43 and champions in’46. They also had Dan McInerney, Des Carroll, J.J. Bugler and Jimmy Fennessy on the Clare Senior team of ’48. For this game Ruan showed a number of personnel changes and positional switches from the first round victory. They lined out as follows. C.Courtney. T.Considine. M.Considine. J.Hassett. T.Casey. P.McNamara. G.Smyth. J .Smyth. P.Leahy. P.O.Loughlin. S.Leahy .P.Kelly. J.Kelly. M.Neylon. J.McNamara. There was a considerable delay before the starting of this match owing to the difficulty of getting umpires! The consolation was that the match was worth waiting for. The game started evenly with scores being exchanged on both sides, Smyth and Kelly for Ruan, Carroll and McInerney for Scarrif. However mid way through the half Scariff hit a purple patch and scored 2-2 without reply. At this stage in the game, it seemed that the speed of the Scarrif forwards would give them an overwhelming lead .The was not reflected on the score board however when the score at half time was 3-5 to 2-3 in favour of the East Clare men. Both teams made positional switches at half time. However early in the second half it was clear that Ruan were the fitter team and had taken control of the game. Points by Smyth and Sean Leahy were followed by a goal in which six men found themselves in the net! The Ruan defence ably led by the Considines, Casey and Gerard Smyth had come to grips with their speedy opponents at this stage evidenced by the fact that Scariff failed to score in the second half. In the closing stages, goals by Miko Neylon and Jer Kelly through brilliant combination put victory beyond doubt. On the final score of 5-8 to 3-5 Ruan had qualified for their first Senior County Hurling Final. Their opponents were old rivals Clarecastle who had defeated Newmarket, Broadford and Tulla on their way to the final. Ruan now entered a period of intensive training under the watchful eyes of Fr. Leamy and Miko Lyons. In 1942 three replays were needed to separate Ruan and Clarecastle in the Minor championship. Clarecastle narrowly won the third game and many of the same players would face each other again in the County Final. The Magpies were attempting to win their third Championship having been Champions in ’43 and ’45 and losing finalists in ’47. • Michael Considine –brother of Tom described as tricky hurler in defence. • Patrick Kelly -“Paudie” Excellent in the semi-final. Lined out for Clare Juniors in ’47. • Paddy Mc Namara-Outstanding Backsman. Clare Junior hurler in ’47. • Joe Mc Donnell-Ex inter–county player. Distinguished himself in many positions. • Paddy Leahy-Clare Minor in ’46 and ’47. • Sean Leahy-Brother of Paddy. Known for his skill and ability. • Jimmy Smyth-Hurler, Footballer and Athlete. Clare minor in ’45, ‘46’, 47’ and ’48. • Paddy O Loughlin-Excellent Hurler .Combines skill with deadly accuracy. • Christy Courtney-First year on the team. Earning a big reputation for himself in goal. • Johnny Mc Namara-brother of Paddy. Has exceptional speed. • Miko Neylon- Defender and forward. Will not be rattled. • Joe Hassett-best known of the team. Fast and clever opportunist. • Tommy Casey- Young player. Improving with every game. • Paddy O Donoghue -Brought off many of Ruan’s scores this year. Clare junior in ’39. • Gerry Kelly-Made a name for himself as a minor and junior. Doing the same at senior level. • Joe Meaney-A young promising hurler. A star of the future. • Sean Crowe-Promising and very clever forward. • Charles Casey-Defender .Very clean and very fast. • Michael Henchy-Youngest member of the panel. Clare minor this year. • Tommy Keating-Team veteren. One of the goalkeeping greats. • Josie Rynne-Transferred from Kilnamona. A dashing hurler with plenty of skill. • Gerard Smyth-Brother of Jimmy. Returned to Maynooth College. Would miss the County Final. The county final was fixed for Sunday October 3rd in Cusack Park Ennis with Mick Quaine from Cratloe as referee. The curtain raiser was the juvenile “B” semi-final between Ruan and Tulla. It was won by the East Clare team on the score of 2-00 to 1-1. Up to 7,000 spectators turned up for this eagerly awaited senior clash. Although due to start at 3.00 the game was delayed by 23 minutes as the teams struggled to get to the pitch. Ruan at that time togged out in Linnanes Hotel in Parnell St. and made their way to the pitch through the gathering crowds. The game was played in mild sunny conditions on a perfect sod for hurling. Ruan appeared in the green and red of Clooney evidence of the close association that existed between both clubs in the 30’s and early 40’s while Clare Castle’s black and white brought great colour to the occasion. The game was a fine exhibition of hurling and at times reached All Ireland standard. In the first half Clarecastle played with the wind and the sun to their backs. There were periods of tremendous hurling punctuated with fine scores. The first score reflected the quality of the opening play when Paddy Leahy, hemmed in by Guinane and Murphy, twisted in a double S and sent the ball like a homing swallow to the Clarecastle net. After a bout of tremendous pressure Clarecastle replied with goals from Mc Mahon and Russell. Points follow from Daly and Russell to help Clarecastle lead 2-2 to 1-0. Individual pieces of great skill had the crowd enraptured and the speed of the play seemed too fast to last. It was now the turn of Ruan to press and goals followed from Kelly and McDonnell and a Smyth point to lead 3-1 to 2-2. From a melee in midfield Jimmy Smyth “emerged like a hurricane” and passed the ball to McDonnell who sent it to J. Kelly for another goal for Ruan which left the first time finalists 5 points ahead. The teams exchanged further points and at half-time Ruan were leading on a score of 4-3 to 2-4. Ruan had the advantage of the sun and a freshening wind in the second half but it was Clarecastle who got the half of to the perfect start with a goal and a point from Mc Mahon and Mc Allister respectively. 10 minutes into the half - the teams were level on 15 points each, 4-3 to 3-6. Minor incursions and injuries now caused some delays but Clarecastle continued to be the dominant team confirmed by a goal from a melee followed by another one from Russell. A fight among spectators now delayed the game by a further 8 minutes but when the game resumed the Magpies defence seemed as impenetrable as the Cliffs of Moher. Ruan responded by making positional switches and introducing Paddy O Donoghue as a substitute for the injured Jer Kelly. The effect was immediate with O Donoghue netting, having smashed his way through the Magpie defence! Chris Murphy and Smyth exchange points before O Donoghue scores another goal to draw the teams level on 6-4 to 5-7 after the Clare Castle defence fails to clear its lines. As the excitement grew spectators encroached on the sidelines and particularly around the Clarecastle goal and play was again stopped. When it resumed the Magpies spurned two clear-cut chances for points instead going for goals. Ruan held firm and cleared upfield for O Donoghue to score his third goal and the game’s last score. Clare Castle made one last effort to reply and Daly almost scored. Referee Quaine blew his final whistle and Ruan win their first Senior Hurling Championship on the score of 7-4 to 5-7.Or did they? Amid all the excitement of scores, injuries, encroachments and delays the referee recorded the match score as a draw 6-4 to 5-7. The County Board called a special meeting the following Saturday to consider the referee’s report. At the meeting Mr Vincent Murphy (Clarecastle delegate) stated that Clare Castle were actually winning at the end of normal time and that they were not responsible for the pitch invasions and that Ruan were getting away lightly with a replay! Miko Lyons (Ruan delegate) responded that Ruan had clearly won the match and that it was the duty of the County Board to award the match to Ruan. The Chairman Fr. Corry said that the Board awarded matches not the referee and as it had been established beyond reasonable doubt that Ruan had won he ruled that Ruan be awarded the match. He awarded the game to Ruan on the grounds that practically everybody present at the match with the exception of the referee saw Ruan win by a goal. He appealed to Clarecastle to accept this decision in the spirit of sportsmanship which had always been associated with club. Clarecastle however appealed the decision to the Munster Council and as a result the referee’s decision was upheld and a replay was ordered for April 24th 1949. Ruan’s wait for its first County Senior championship had just got longer. As a goodwill gesture the County Board gave both clubs £20 to prepare for the replay! Ruan played Newmarket in the first round and easily accounted for them on the score of 7-4 to 1-3. Newmarket had dash and vigour but they were far from being equal to the Ruan men in field craft and combination. Ruan led at half time by 5-3 to 1-0 and ran out easy winners at the final whistle. Two weeks after playing the Senior final against Clarecastle many of the same players from both side faced each other again when Ruan lined out against C.IE. in the Intermediate semi-final. The six players from Clarecastle were W. McAllister , J. McAllister, J. Moloney, M. Daly., P.J. Daly and M. McMahon. Ruan were superior from the start and had outstanding scores from J. Smyth, P. ODonoghue Tommy Casey, Sean and Paddy Leahy. The match ended in a convincing win for Ruan who had now qualified to play Whitegate in the final. On October 31st Tulla hosted the Intermediate final. Both sides fielded teams which featured so prominently in the Senior Championship. Whitegate got off to a tremendous start and led by ten points at half-time. However Ruan “tenaciously drew level and by brilliant combination, fast and penetrating hurling gained a mastery that was properly reflected in the result.” Ruan won their second Intermediate Championship by a whopping 11 points. Ruan and Dysart entered separate teams in the Junior Championship. Dysart were in a group that also contained Tubber and Ennis Faughs. Tubber had a convincing win over Dysart in Round One while the Faughs beat them by five points to qualify for the semi-final. Best for Dysart in this mach were S.Leahy, P.O.Loughlin, Ml.Henchy and J.Hassett. Expectations were high that the first round match between Ruan and the newly formed Rineanna would be a close and interesting encounter but nothing could be the further from the truth. Played in Cusack Park on July 11, Ruan crushed their opponents on a score of 7-1 to 0-4. On September 19th Ruan defeated Cratloe in the Divisional Final to qualify to meet Ennis Faughs in the final. This game was set for Cusack Park on Sunday November 11th and generated great interest among hurling followers. Ruan entered the game as strong favourites as they fielded many of their club’s senior players. Taking the place of the absent Dysart players were defenders Charlie Casey and John Waring while Tom Pyne, Patrick Considine, Jack Donoghue and Johnny Purcell filled the attacking positions. Over the hour Faughs were the better combination even though they had not the physical strength possessed by Ruan. They also lacked penetration and would have won had they a finisher like Smyth on their side. Faughs led at half-time on the score of 3-1 to 2-0 but Ruan rallied in the second half and led by two points. Two further Faughs goals followed by one from Ruan left the Ennis team one point ahead entering the closing minutes. Amid tremendous excitement J. Smyth had a seventy saved and sent outfield by the Faughs backs but Smyth again got possession and drove over the equalising score. The final score was Ruan 5-1 Ennis Faughs 5-1. Best for Ruan were Smyth, Courtney, Purcell, Meaney, and P. Kelly P.McNamara and Waring. Christy Glynn, Bruddy Mann, Paddy Duggan, Miko Ball and Ralphy Burns impressed for the Faughs. A feature of the game was the absence of a single free resulting from foul play. The referee Michael Mc Mahon (Newmarket) controlled the game well and refused to allow play to continue until the area around the goals was clear. Despite the County Board refusing admission to the sideline, supporters invaded the pitch when players became injured and it was fortunate that there were no serious incidents. The replay was again fixed for Cusack Park. Ground conditions on the day were terrible as water and mud covered large area of the pitch. It was difficult to identify players as they became mud covered or became hidden from view by splashes of muddy water. Despite this the hurling was of a fairly high standard. What was not in doubt on this occasion was the superiority of Ruan and they raced into a 5-4 to nil lead before the Faughs rallied with two Paddy Duggan goals before half-time to leave the score at 5-4 to 2-0 in favour of Ruan. Jack Donoghue (2) Jer Kelly (2) and Purcell were the Ruan goals corers. This dominance continued through the second-half with Purcell netting his second goal. The Faughs rally with a Glynn goal but their dominance was short lives as “Ruan raced into attacked and in All Ireland fashion threw all they knew into the assault and had two lightning goals. “ This left Ruan leading on a score of 8-5 to 3-0 fourteen minutes into the second half. The match then ended abruptly when one of the goal umpires - having been splashed all over with mud - informed the referee of his intention of leaving! As soon as this occurred there was an immediate encroachment of hundreds of supporters onto the pitch. The referee Jack Hogan from Newmarket was followed by a large crowd to his car and informed the local reporter that “Everything will be seen in my report to the County Board” In it he stated that when a substitute umpire was provided, the Faughs captain objected to him. The Rev. Chairman said that the referee was empowered by rule to appoint another umpire and the game must be awarded to Ruan. Ruan had won their second Junior Championship - albeit in unsatisfactory circumstances. Jimmy Smyth was the outstanding player while others to shine were Paddy McNamara, Paudie Kelly, Christy Courtney and all the gaols corers. Burns, Fleming, Mann, Duggan, Glynn and McEnery in goal were best for the Faughs. The Ruan Team was; C. Courtney, T. Considine, Ml. Considine, C. Casey, P. Kelly, P.McNamara, J. Waring, J. McNamara, J. Meaney, P. Considine, J. Smyth, T. Pyne, J. Purcell, J. Donoghue, J. Kelly. Ennis Faughs; M. Mc Enery, J.Molloy, Rr.Burns, S.Moloney, S.Mahon, C.Glynn, P.J.O Dea. R.Connellan, J.Keane. J.Fleming.T.Strand. B.Mann. T.Moloney. P.Duggan.M.Ball. Four teams entered this competition. They were Ruan, Ennis Newmarket and Clare Castle From the information available Clare Castle received a walk over from Ruan in the opening round. Ruan had to defeat Newmarket to stay in the competition. If t were successful they would then play Ennis where another win would make it a three way play off. As it transpired Newmarket received a walk over from Ruan and were crowned Minor Champions for ’48. Other Interesting Facts of ’48. Colleges Hurling; In his final year at school and fifth year on the team Jimmy Smyth captained St. Flannan’s College in the Harty Cup Final against St. Colman’s Fermoy losing after a second replay on the score of 6-4 to 4-6. Playing at mid field Smyth had been man of the match in the first replay scoring 2-3. Munster Minor Championships; J. Smyth, Michael Henchy and P. Purcell were selected on the Clare Minor Hurling team that lost to Waterford in Thurles on a score of 9-5 to 0-4 .Smyth also lined out at full forward for the Clare minor footballers who defeat Limerick in Round One but lose to Kerry in the Semi-Final on the score of 9-5 to 1-5. Junior Hurling; Sean Leahy played wing forward for the Clare junior team that lost to Waterford in the Munster Junior Championship on the score of 4-4 to 4-3. Joe McDonnell was a sub on the day. National Hurling League. J.Smyth and T. Casey made their Senior Inter –County debuts when they played for Clare v Galway in the N.H.L. in Ennis on Oct.24th. Final Score; Galway 5-6 Clare 3-11. So ended 1948 for Ruan Hurling Club .However the prospect of replaying the County Senior Final must surely have shortened the winter for supporters and players alike. The Clare Champion Newspapers of 1948.